Taking an SAT exam is a little like banging your head against the wall: You feel good when you stop! If you’ve been working your way through the five practice tests in this book in order (although you don’t have to do so), this test is almost the last bit of wall. So reread the general SAT directions at the beginning of Chapter 20 and get ready to smash any possible barrier between you and a higher score. Answers and explanations for this exam appear in Chapter 27, but don’t peek ahead until after you finish going through this test! What does one learn, if anything, from failure? Can failure be a benefit or must it be harmful? In a well-organized essay, address these questions, developing and supporting your point of view by drawing upon history, literature, current events, or your own experience and observations. 1. Achieving a vaccination rate of 25 percent, said health officials, gives “herd _____” and prevents a serious outbreak of the disease. 2. After his novel had been rejected by several publishers, the critic wrote _____ and inappropriately about every work of fiction that crossed his desk. 3. The audience, initially _____, soon listened with _____ attention to the spellbinding orator. 4. Ms. Benning graciously chose to _____ the election to her opponent once it was clear that the voters had rejected her bid for office. 5. Having chosen a _____ dessert, the diner _____ for the increased caloric intake by eating very little of the main course. 6. Despite _____ planning, the team was surprised by the strength of its opponents. 7. Over the course of several tours of duty, the _____ recruit became a battle-tested soldier. 8. May, known for her _____ nature, should look for a telephone plan that allows an unlimited number of minutes. Directions for Questions 9–12: Choose the best answer to each question based on what is stated or implied in the passages or in the introductory material. These two passages focus on scientific discovery. 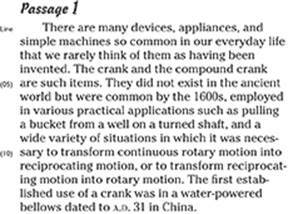 They are excerpted from Scientific American Inventions and Discoveries by Rodney Carlisle (Wiley). Directions for Questions 13–24: Choose the best answer to each question based on what is stated or implied in the passage or in the introductory material. 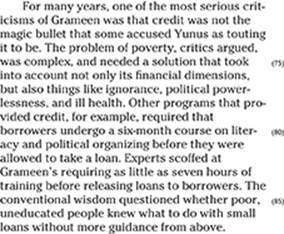 This passage focuses on the work of Muhammed Yunus, an economist and banker from Bangladesh who created the Grameen Bank to give small loans to those too poor to qualify for traditional loans. 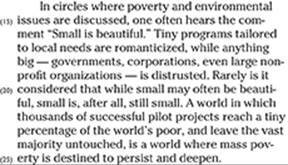 The passage is excerpted from Small Loans, Big Dreams by Alex Counts (Wiley). 13. As used in Line 11, “pilot project” is best defined by which other phrase from the passage? 20. 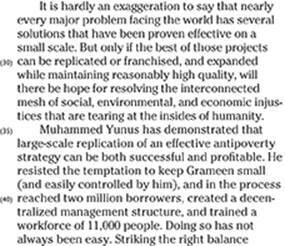 The critics of the Grameen Bank most likely favor programs that focus on which of the following? 22. In the context of Line 92, what is the best definition of “conscious”? 23. 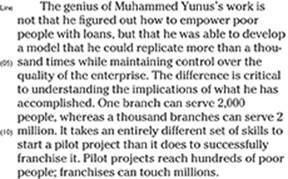 With which saying would Muhammed Yunus be most likely to agree? (B) Imitation is the highest form of flattery. (C) The love of money is the root of all evil. (D) A penny saved is a penny earned. (E) A fool and his money are soon parted. 2. Based on the triangle above, which statement is true? 3. 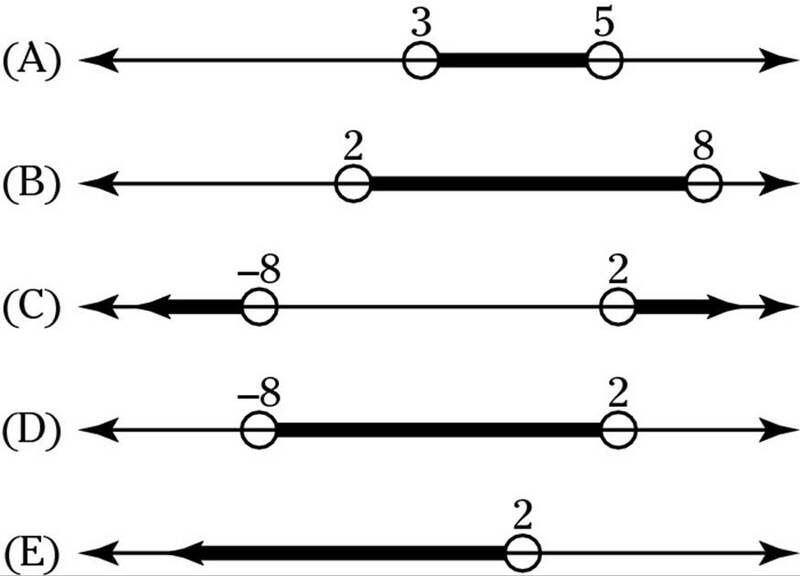 Which of the following number lines represents the solution to the inequality ? 4. A store sign advertised, “All Coats _____% Off,” but someone had forgotten to write in the correct percentage. If a coat that usually costs $75 was on sale for $60, what was the missing percentage? 6. 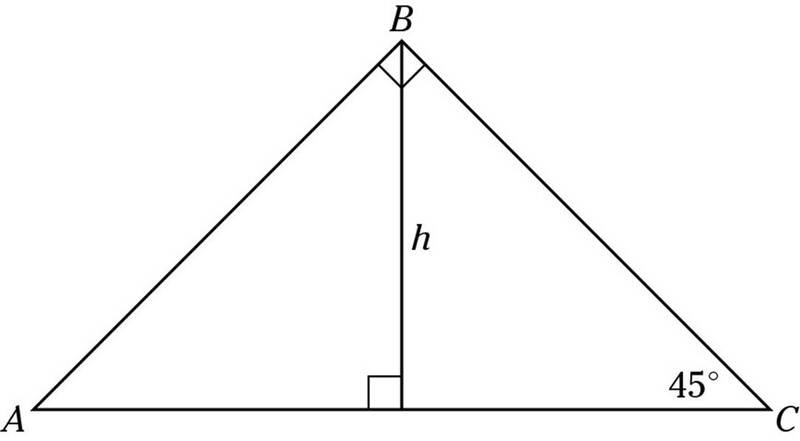 What is the length of side b in the triangle above? 10. Let x~y be defined as . For what value of x does x~3 = x? 11. Which of the following must be true for x, given that x is a negative integer? 13. 25% of the marbles in a jar are red. After 20 red marbles are added to the jar, 50% of the marbles are now red. How many total marbles were originally in the jar? 15. Gasoline is being poured into a cylindrical container with a radius of 5 feet and a height of 6 feet. Originally, the gasoline was stored in the box-shaped container shown here. Roughly how many of these containers would be needed to fill the tank completely? 16. 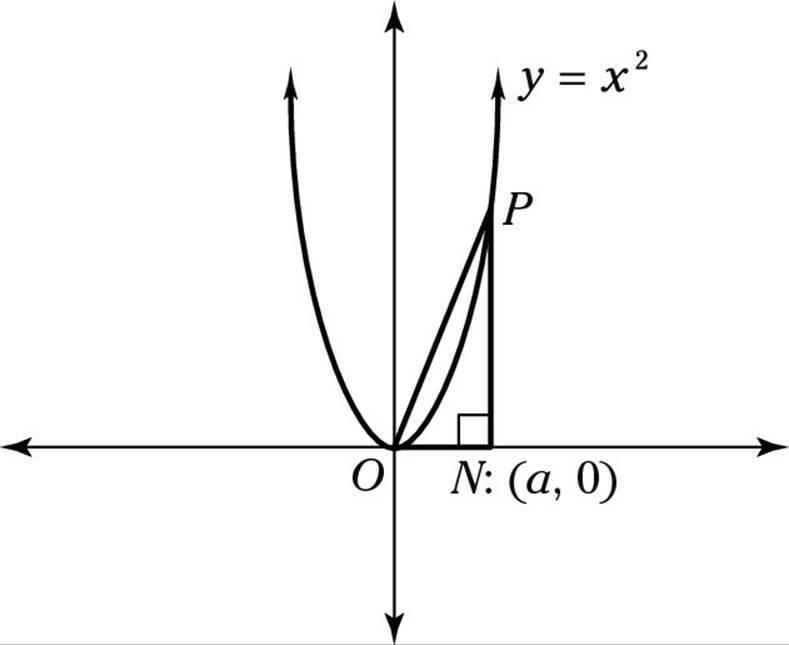 Line l passes through the origin and has a slope of 2⁄3. 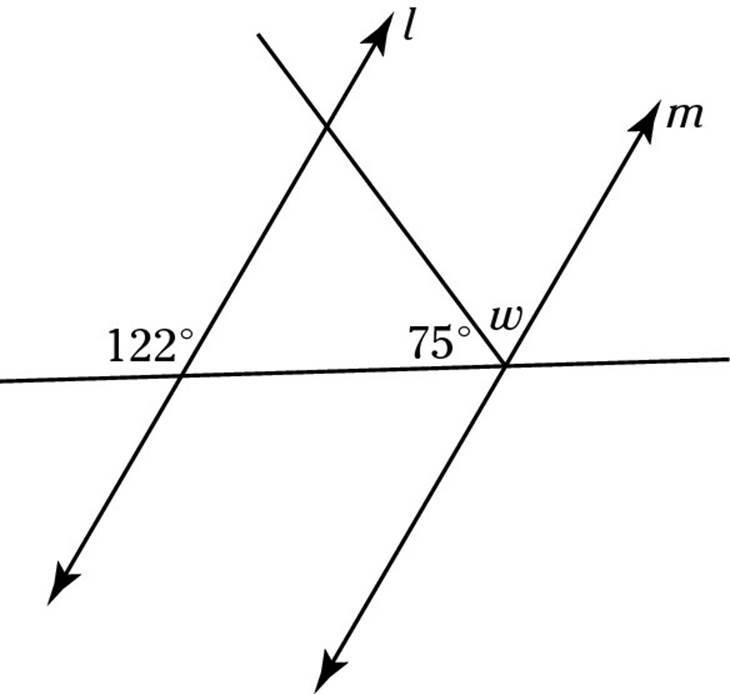 Line m is perpendicular to line l and intersects it at the point (–6, –4). 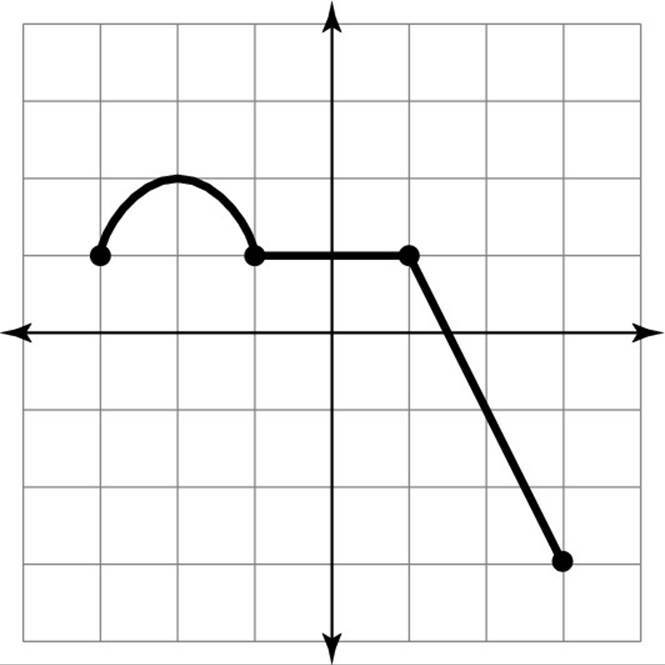 Where does line m cross the y-axis? 17. 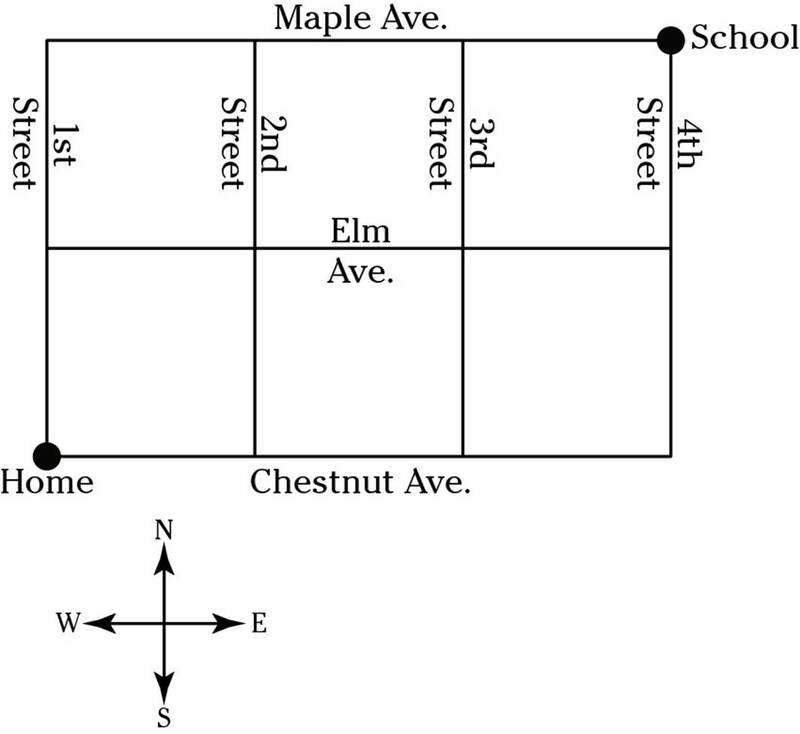 The diagram above shows the possible routes from Benjamin’s home to his school. He always walks only north and east, and he makes sure to always walk at least one block on Elm Avenue. How many different routes can he take to get to school? 18. Two circles lie in a plane and share the same center but have different radii. A line is drawn such that the line never enters the smaller circle. 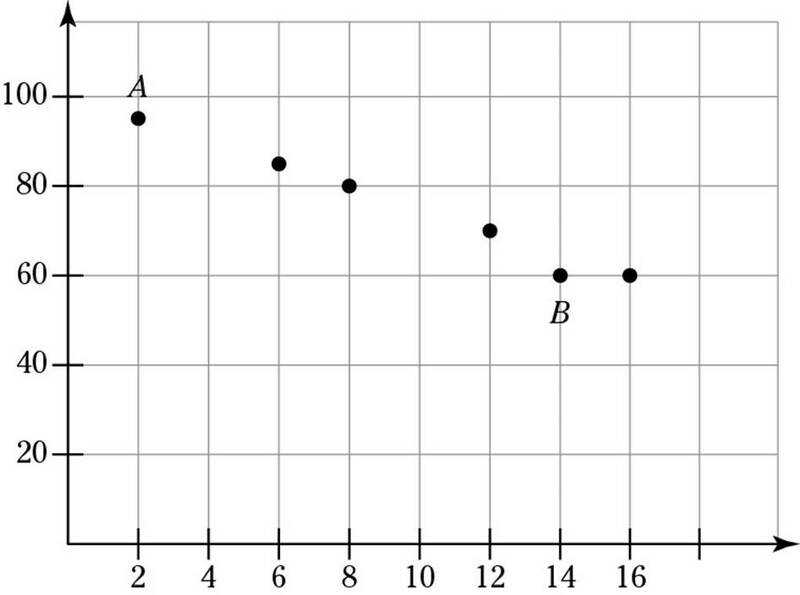 What is the maximum number of total points at which the line could touch the circles? 19. A list of three integers has an average (arithmetic mean) of 6. If the median of the numbers is –1, what is the smallest positive number that could appear in the list? 1. Artists, however realistic their styles, are not content merely to record a scene but rather strive to _____ it. 2. The outcasts searched for a path out of the _____ and into the fertile _____ of acceptance. 3. The shopper _____ through the stores in a leisurely way, more interested in passing time than acquiring items. 4. Their _____ romantic bliss soon gave way to boredom, interspersed with the usual tensions of everyday life. 5. Antiquated handwriting is characterized by fancy _____, quite alien to the clean, modern lines favored today. Directions for Questions 6–9: Read the following passages, and choose the best answer to each question based on what is stated or implied in the passages. The first passage is an excerpt from Jean Jacques Rousseau’s Emile. 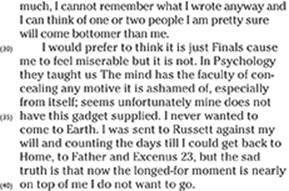 The second is an excerpt from an autobiographical novel written by James Weldon Johnson in the early 20th century. 7. 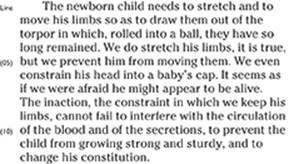 Which of the following best expresses the meaning of “constitution” (Line 12) in the context of this passage? 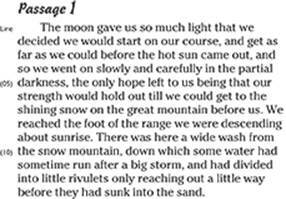 Directions for Questions 10–18: Read the following passage, and choose the best answer to each question based on what is stated or implied in the passage. 10. Based on evidence from the passage, which of the following is probably true about “Excenus 23” (Line 2)? I. It is an area of Earth. II. It has a dry climate. III. It is a fantasy world created by the ­narrator. 13. Which of the following best expresses the meaning of “tough enough to break a molar on” (Line 19)? 18. Given the narrator’s reference to “Carpe Diem,” which of the following actions is likely? (A) B and the narrator will stay on the island. (B) The narrator will find a way to return to Earth. (C) The father will visit the narrator. 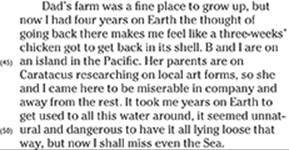 (D) The narrator will sail in a boat. (E) The narrator will refuse to leave Earth. 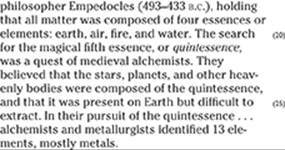 Directions for Questions 19–24: Read the following passage, which is from The Universal Book of Astronomy from the Andromeda Galaxy to the Zone of Avoidance by David J. Darling (Wiley). Answer the questions following the passage by choosing the best answer. 20. In the context of Line 14, which of the ­following best expresses the meaning of ­“harbors”? 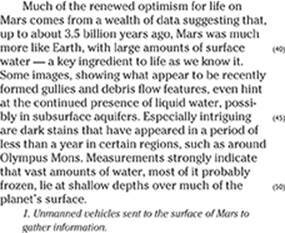 (A) Mars has enough water to sustain life. (B) Some microbes on Earth could survive on Mars. 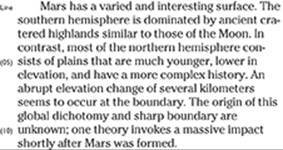 (C) Human beings have been fascinated by the possibility of life on Mars. (D) Mars expeditions have discovered evidence of extinct life forms. (E) Mars expeditions have not found evidence of living beings. 23. The statement that “interest has been rekindled” (Line 24) implies which of the following? (A) Scientists never give up. 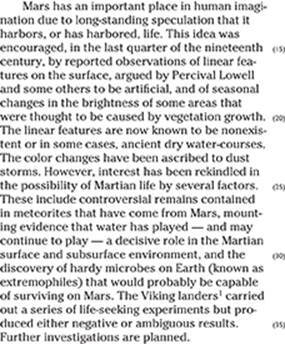 (B) For a period of time, people discounted the possibility of life on Mars. (C) Funding for Mars expeditions is dependent upon scientists’ interests. (D) Scientific experiments are variable. (E) Evidence of life on Mars is difficult to obtain. 1. Which of the following points is farthest from 2 on a number line? Questions 2 and 3 refer to the following chart. 2. 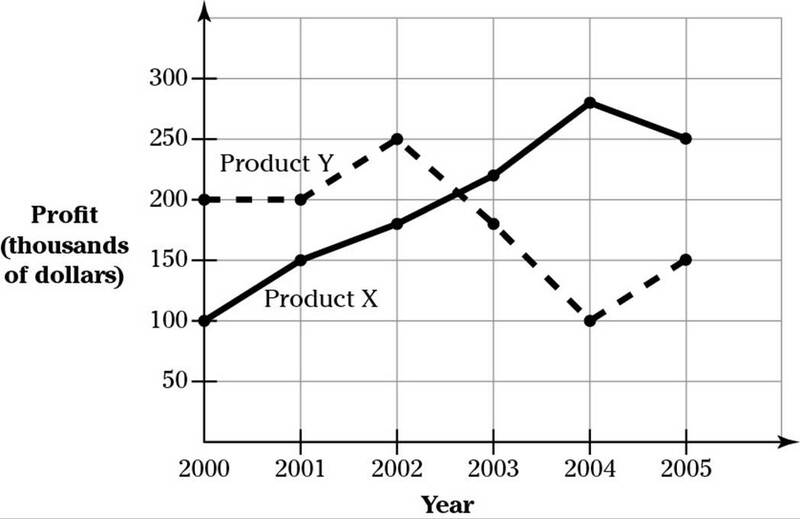 The chart shows the profit a company made on two products over a five-year period. During what year was the company’s total profit the greatest? 3. Between which two years did Product X have the largest percent increase in profit? 4. 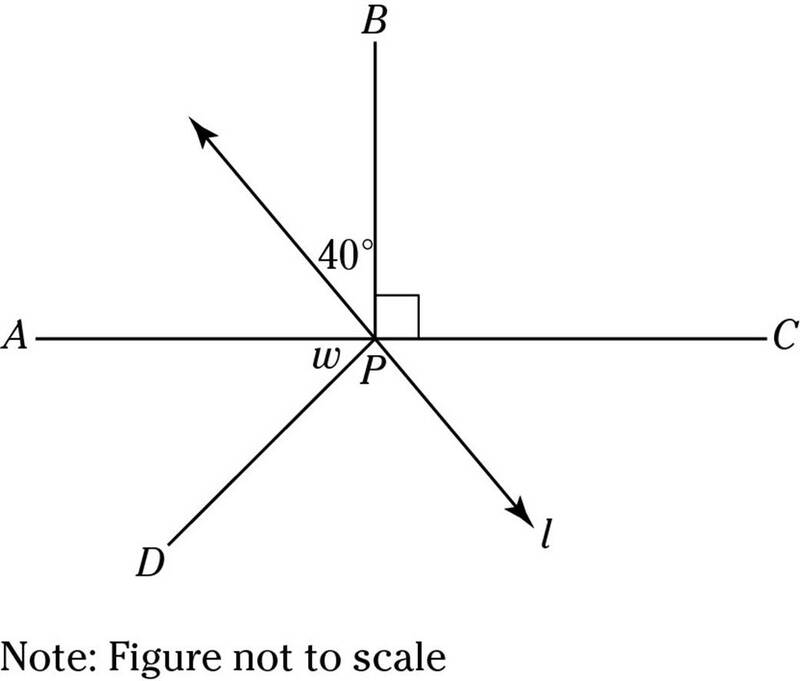 In the figure above, if APC is a straight line and line l bisects angle DPC, what is the measure of the angle marked w? 6. If j is positive and k is negative, which of the following is the greatest? 1 1 2 1 2 3 1 2 3 4 1 2 3 4 5 . . .
8. The number above begins with a “1”, then continues “12,” “123,” “1234,” and so on until the number “9” is reached. How many digits are in the final number? Directions for student-produced response Questions 9–18: Solve the problem and then write your answer in the boxes on the answer sheet. 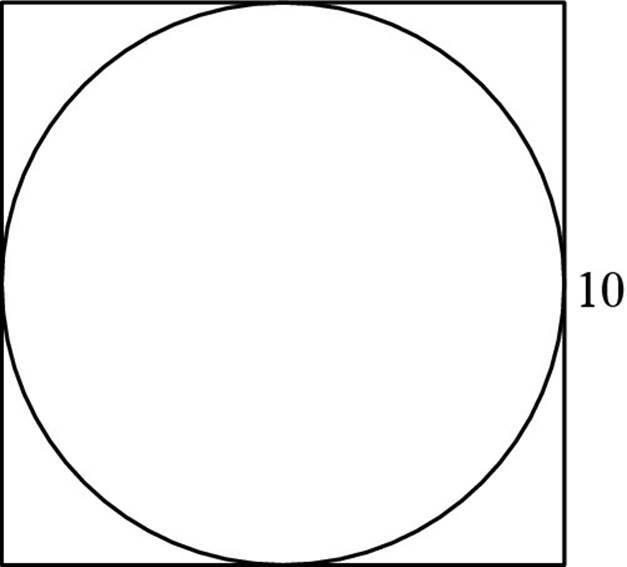 Mark the ovals corresponding to your answer, as shown in the following example. Note the fraction line and the decimal points. Mixed numbers, such as 31⁄2, must be gridded in as decimals (3.5) or as fractions (7⁄2). Do not grid in 31⁄2; it will be read as 31⁄2. A question may have more than one answer. Grid in only one answer. 9. At a certain school, each student has an ID number containing three digits. The number may not begin with a zero, and may not end with a 7, 8, or 9. How many possible ID numbers are there? 10. Lorraine jogged for 8 minutes at a rate of 400 feet per minute, then walked for 2 minutes at a rate of 200 feet per minute. What was her average speed during this time, in feet per minute? 11. Find n if 32n = 22n + 33. 12. Let a number be “pretty” if it is divisible by 5. Let a number be “friendly” if it only contains even digits (42, for example). Let a number be “happy” if its digits add up to 10 (523, for example). Find the smallest number that is pretty, friendly, and happy. 13. At South Side High School, one-half of the juniors have English class second period, one-third of the juniors have English class fifth period, and 12 students have English class sixth period. If every student has exactly one English class, how many students are in the junior class? 14. In the drawing above, . Find the value of w in degrees. 15. Find a value of x which satisfies x2 + x = 72. 16. If x + 11 = 5y and 3x – 11 = 9y, find the value of . 17. 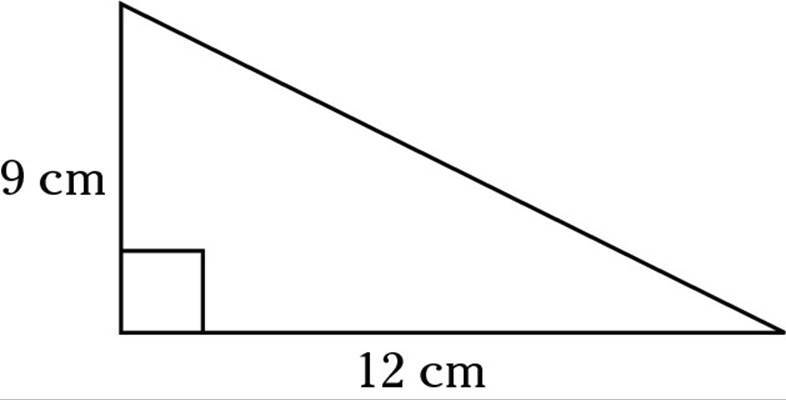 Given that point P in the drawing above lies on the graph of y = x2, and that the area of triangle NOP is 108, find a. 18. Given and g(x) = x – 8, find the value of x for which f(x) = g(x). Directions for Questions 1–11: Each sentence is followed by five choices. Choose the answer that best improves the sentence. If the underlined portion of the sentence is best left alone, choose (A). 1. The building inspector arriving in ten minutes, the construction manager instructed the brick layers to complete the wall quickly. 2. 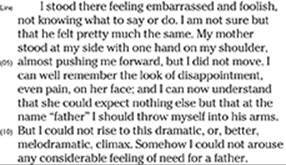 The actor specialized in a nasal twang, sounding as if he swallowed a balloon. 3. The fierce gusts of wind from this storm, now approaching the coast, breaks previous records for that area. 4. The plane, which was flying low over the city, and which was equipped with special lenses to capture night images, despite the low levels of light. 5. The jury discussed the matter whether the defendant should be found guilty, considering the fact that the defense attorney presented compelling reasons for acquittal. 6. The passengers waited five hours to be evacuated from the derailed train, fortunately no one was injured. 7. Being as it was suspicious, the old bones the janitor found were preserved for inspection by police officers. 8. The chalk dust and mold in that classroom may cause health problems for those who spend time there. 9. The new electronic reading device, capable of containing hundreds of books and lightweight as well for easy travel. 10. Because of the slow economy, the luxury department store is selling their merchandise at bargain-basement prices. 11. One factor matters more than deficit spending, depletion of the Federal Reserve funds, and a high unemployment rate: that consumers are confident. 30. Which of the following would be the best revision, if any, of Sentences 1 and 2? (B) The ladder I bought last week has a sticker on it; it tells me that I “could be injured” if I fall off. (C) The ladder I bought last week has a sticker on it, which tells me that I “could be injured” if I fall off. (D) According to the sticker, I “could be injured” by me falling off the ladder I bought last week. (E) The ladder I bought last week has a sticker warning me that I “could be injured” if I fall off. 31. Which of these sentences, if any, should be inserted between Sentences 3 and 4? 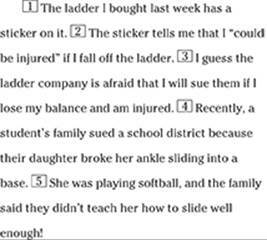 (B) I understand the ladder manufacturer’s fear, because some people sue for injuries they themselves should have prevented. (C) I am not the only one who could sue; others do too. (D) Lawsuits, which worry the ladder company, happen at times, even when they should not. (E) I won’t sue because I won’t fall off the ladder, but sometimes people do get hurt. 32. To improve the logical structure of this essay, which change should the writer make? (B) Move Sentence 6 to the end of the first paragraph. Begin the second paragraph with Sentence 7. (C) Move Sentences 7 and 8 to the end of the first paragraph. (E) Begin the essay with Sentence 6. 33. 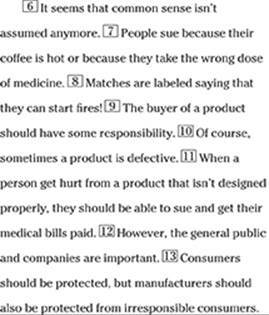 How should Sentence 11 be revised? (B) When a person gets hurt from a product that isn’t designed properly, you should be able to sue and get your medical bills paid. (C) When people get hurt from a product that isn’t designed properly, they should be able to sue and get their medical bills paid. (D) People can be injured by their products, that aren’t designed properly, and they should sue for medical expenses. (E) Injured by a product that isn’t designed properly, they should be able to sue and get their medical bills paid. 34. Which of the following is the best revision of Sentence 12? (C) Combine it with Sentence 13. (D) Move it to the end of the essay. (E) Insert it before Sentence 1. 35. 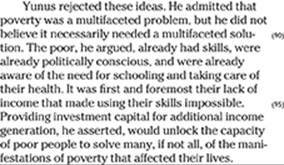 Which is the primary strategy used in this essay? 1. Studies show that teenagers often _____ parental advice and turn instead to _____. 3. In addition to capturing vast amounts of data, the newest scientific instruments also _____ the information. 4. The cause of vertigo, or dizziness, may not always be _____ unless other physical symptoms are present. 5. The grueling ordeal that marathon runners undergo may take a toll, but _____ athletes minimize the chances of injury. 6. To make the bill more _____ to voters, the senator added an amendment that phased in the tax increase. Directions for Questions 7–19: Choose the best answer to each question based on what is stated or implied in the passages or in the introductory material. Both passages discuss Death Valley, an area in the western United States. 8. Which statement about the narrator and his fellow traveler in Passage I is true? (A) They are tired from hiking all day. (B) The narrator and his fellow traveler cannot agree on a course of action. (C) They are in danger of death. (D) Their advance planning saves their lives. (E) They compete for food and water. 9. Which statement most likely reflects the views of the travelers in Passage I? (A) One for all and all for one. (B) Every man for himself. (C) Absence makes the heart grow fonder. (D) You don’t know what you have until you lose it. (E) No news is good news. 11. The narrator in Passage I sees their early start as “providential” (Line 40) for which of the following reasons? I. The travelers knew that ice would melt in the heat of the day. II. The travelers started early to avoid the heat of the day. III. The travelers found the ice by chance. 12. 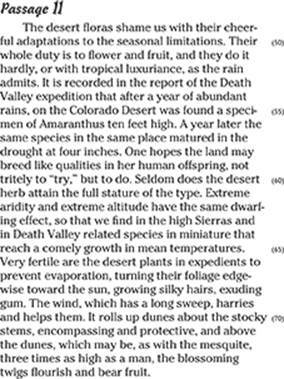 Why do desert plants “shame us” (Line 49)? (A) Plants are more adaptable than people. (B) Plants provide flowers and fruit. (C) Human actions harm the environment. (D) Humans use plants without thinking. (E) Some plant species attain greater height than is possible for human beings. 13. Which of the statements below best expresses the meaning of “One hopes the land may breed like qualities in her human offspring” (Lines 58–59)? (A) Human beings, like plants, should conserve energy. (B) Human beings should cultivate the same survival skills seen in desert plants. (C) Human beings should be more in tune with nature. (D) A natural habitat should be respected. (E) Trying isn’t good enough. 15. 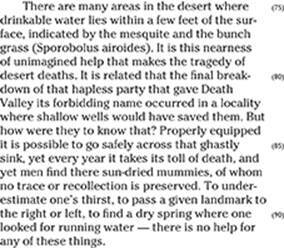 According to Passage II, why is desert death a “tragedy” (Line 79)? (A) Travelers don’t understand how difficult it is to cross the desert. (B) Most deaths are preventable. (C) Help is not available when travelers need it. (D) Many die because they are not aware of nearby water sources. (E) Desert maps are unreliable. 16. Which of the following best defines “sink” in the context of Line 86? 18. 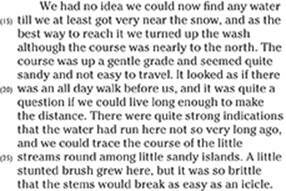 Which comment would the author of Passage II be most likely to make to the travelers described in Passage I? (A) You should have stayed away from the desert. (B) It was your responsibility to be aware of all water sources. (C) You must prepare well in order to have a safe journey. (D) You should have looked for landmarks. (E) On arrival, adapt yourself to the desert environment. 4. 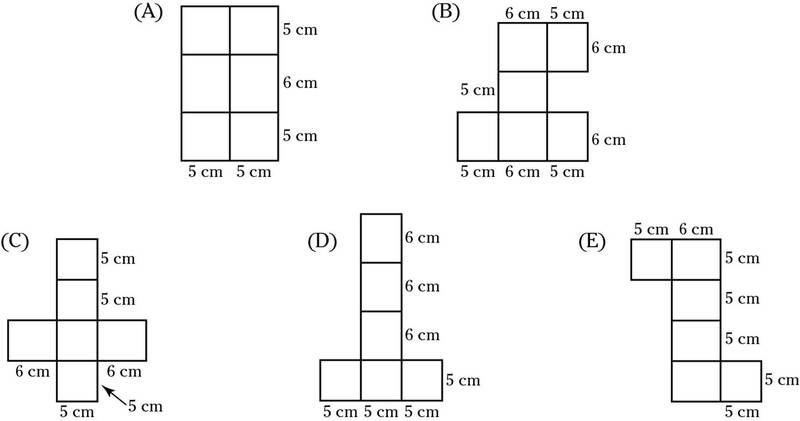 Which of the following patterns could be folded up into a six-sided rectangular box, without making any cuts? 9. Sergei decided to give everyone else in his study group 3 candies each, planning to have 2 left over for himself. However, one member of the group was sick; as a result, he gave 4 candies to everyone who showed up, and there was only one left over for him. How many candies were originally in the bag? 10. 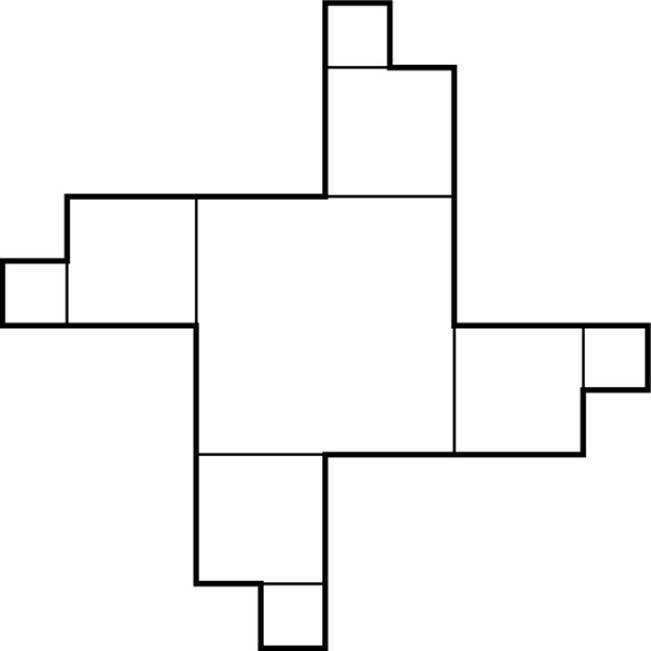 In this figure, each side of the large center square is twice as long as each side of the four medium-sized squares. Each side of the medium-sized squares is twice as long as each side of the four small squares. 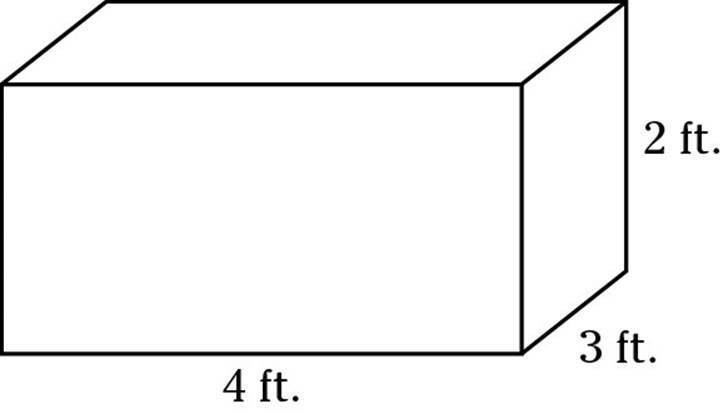 If the small squares have sides of length 1 cm, find the perimeter of the entire figure. 11. At a family reunion, 4 men have a grandson present, 12 have a son present, and 21 have a father present. What is the minimum number of men that could be at the reunion? 15. Ms. Belton’s class and Ms. Jimenez’s class have no students in common. If 45 percent of Ms. Belton’s students play a sport, 30 percent of Ms. Jimenez’s students play a sport, and 40 percent of the students in the two classes combined play a sport, which statement must be true? 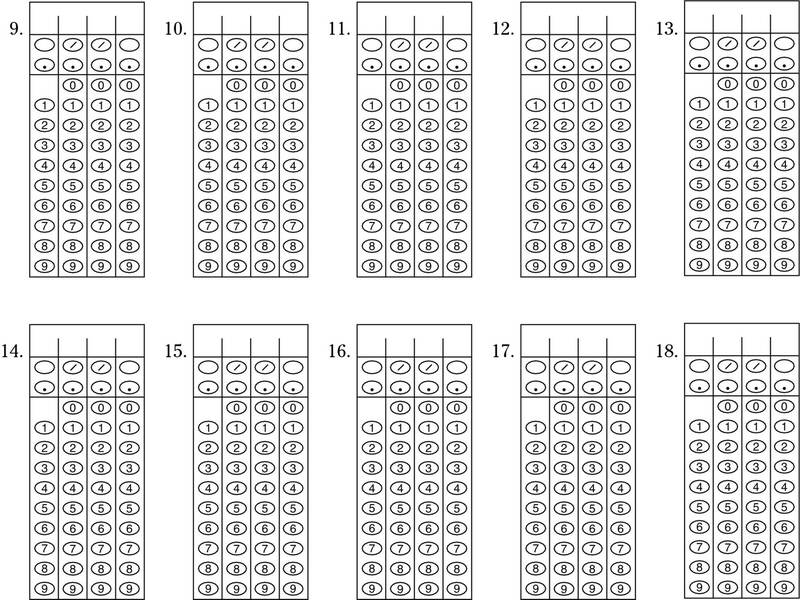 (A) The two classes have the same number of students. (B) The two classes have 30 students total. (C) Ms. Belton’s class has exactly 20 students. (D) Ms. Jimenez’s class has twice as many students as Ms. Belton’s. (E) Ms. Belton’s class has twice as many students as Ms. Jimenez’s. 16. The drawing above shows four identical triangles surrounding a smaller square. 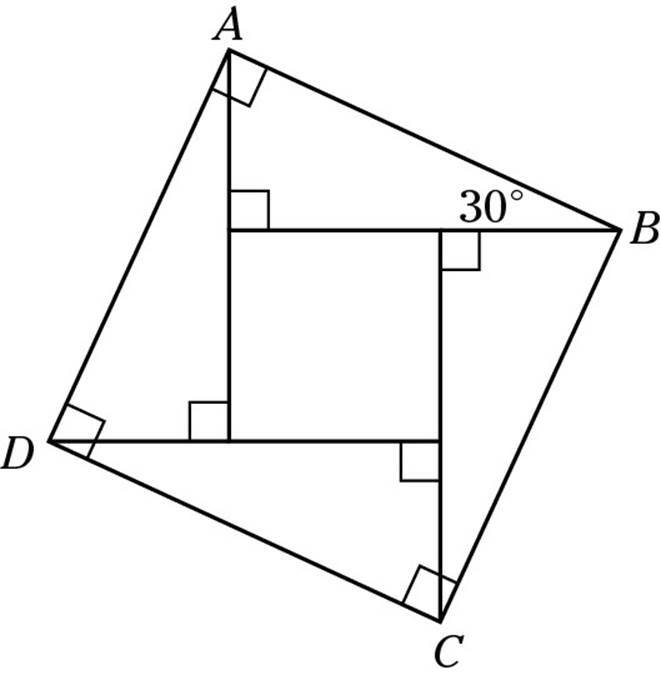 Given that AB = 10, find the area of the square. 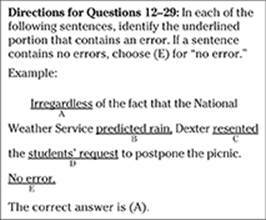 Directions: Choose the one answer that best improves the sentence. 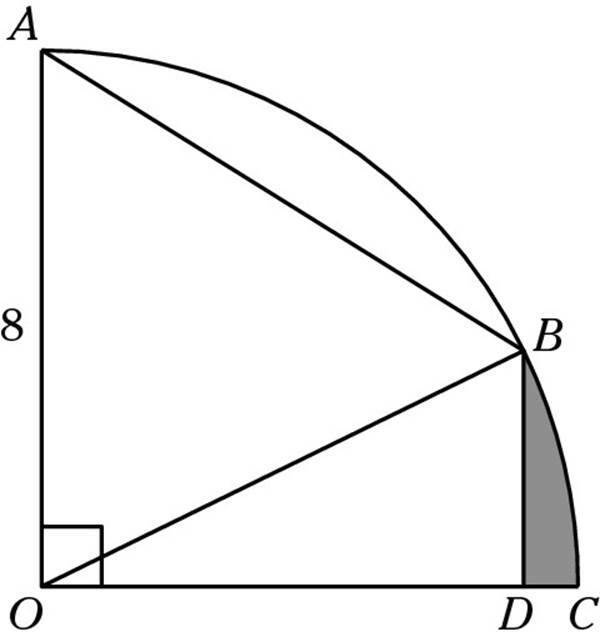 Mark the corresponding oval on the answer sheet. If the underlined portion of the sentence is best left alone, choose (A). 1. Both jumping off the sofa, a flash of lightning exploded over our heads and thunder echoed in our ears. 2. The theater company applied for a variety of grants, but only was given funds by the National Endowment for the Arts. 3. Parents objected to the fact that in this term’s exercise classes, students studied neither good nutrition nor how exercise is beneficial for health. 4. Skidding across the icy road and fighting to control the car, the winter storm frightened the driver. 5. In a recent scientific survey, it showed that a simple checklist of safety precautions can reduce post-operative complications by 50%. 6. Prized for its ability to mimic human speech, mynah birds are popular pets in many parts of the world. 7. Director Alfred Hitchcock is equally as renowned for his suspense films as for his comedies. 8. In 1981, Sandra Day O’Connor became a Justice of the Supreme Court, she was the first female to hold that position. 9. The foundation moved its headquarters to New York ten years ago and was located on that city’s most elegant street, Park Avenue, until recently. 10. The architects’ job is to try and design an energy-efficient, cost-effective structure. 11. The ancient Mayans, performing human sacrifices in religious rituals, they understood the human circulatory system. 12. If I would have known about your allergy, I wouldn’t have served peanut-butter cookies. 13. 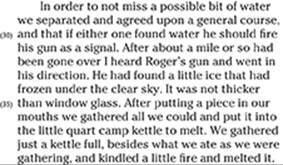 The park ranger spoke at length to the campers, Roger and he, who attempted to feed the animals. 14. This is the only one of the books in that chef’s immense library that has a recipe for salt codfish.